Hey guys! I hope your weekend is going great! I’ve got a quick, no-cook meal prep idea for you this week because sometimes you just don’t want to cook, ammiright? Yeah, that’s me today. Luckily this meal prep comes together in like 15 minutes and now I have my lunches taken care of for the next four days! Woot! I made a double batch of the Tuna and White Bean Salad today because the original recipe makes about 3 servings, but I wanted four larger, main-dish sized servings. 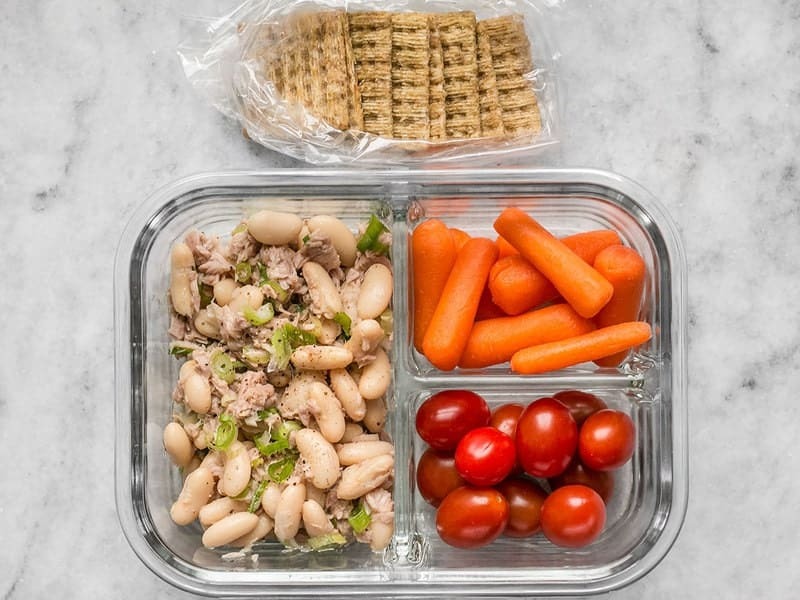 I also kept these lunch boxes on the low-carb side, but if you feel like you need some carbs to keep you full you can add some crackers or even a half a pita pocket to stuff the tuna and white bean salad into (I’d carry the pita on the side and stuff the pita with the salad just before eating). I also thought about mixing up some dilly vegetable dip to serve along with the tomatoes and carrots, but decided last minute that I didn’t need it. I like to keep things simple and uncomplicated. 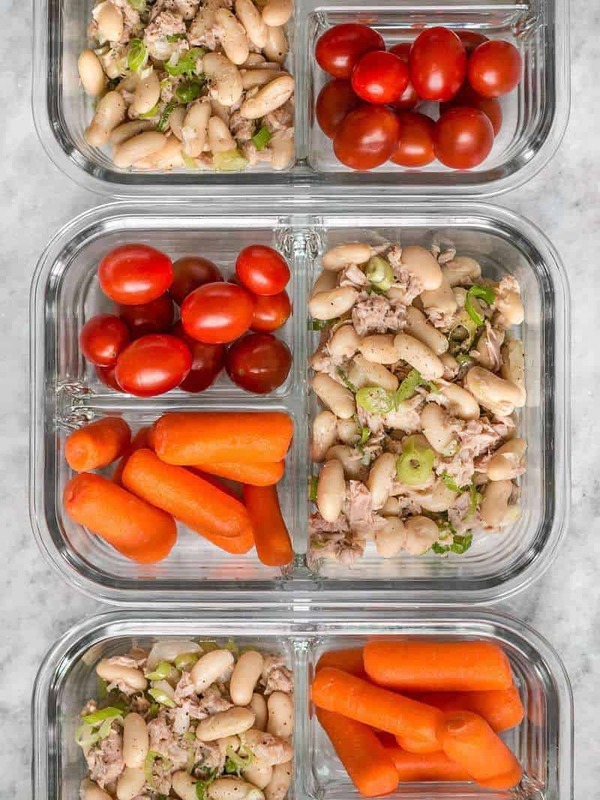 I love the light lemon flavor of this Tuna and White Bean Salad, but if you want to punch it up even more, try using lemon pepper seasoning in place of the regular pepper in the recipe. It really adds zing! No leftovers this week! Yay! Well, except half a bag of baby carrots, but I guarantee those will get eaten. Especially if I make some hummus! P.S. Yet another reason I love Aldi, I got those Triscuit knock off crackers (rosemary olive oil flavor!) for only $1.69 per box. Score! Love the ease of this! Will definitely add to my grocery list for next week.